Your brain has nerve cells that fire electrical signals and oscillate in distinctive arrangements called brainwave patterns. These patterns are closely connected to your thoughts, emotions, moods, biological chemistry, everything you do, and really, everything you are. Because Brainwave Wizard audio guides you into different brainwave states (and various states of meditation), it is helpful to understand the different frequencies and how they contribute to your state of consciousness. Since most of us spend our days in the beta state, Brainwave Wizard sound technologyexcludes the beta brainwave frequencies, and includes only those responsible for the most beneficial brainwave states, physically and metaphysically: alpha, theta, and delta. The beta brainwave is the predominant frequency when we are fully awake and alert. Active awareness directed to the outer world. 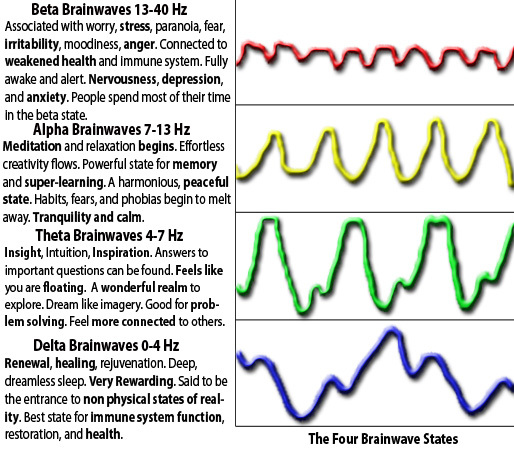 Beta brainwaves are present during stress, paranoia, worry, fear, and anxiety. They are also present during hunger, depression, irritability, and moodiness. Insomnia is the result of producing excessive beta brainwaves. Associated with excessive “mental chatter” and self-destructive impulses. Too much time in the beta state weakens the immune system. Beta brainwaves make up much of our conscious mind. The alpha state is where meditation and relaxation begins. We start to encounter the wealth of effortless creativity flowing just beneath our conscious state. Studies have shown the alpha state has been associated with “peak performance.” Elite athletes produce alpha brainwaves prior to concentrated performance (shooting a free throw, hitting an important golf shot). Amateur athletes produce more of the anxious beta brainwaves. In the alpha state we learn, process, memorize and recollect large sums of information fast and with peak effectiveness. Highly creative people have been shown to have “bursts” of alpha brainwaves when they have good ideas. Alpha brainwaves are thought to make the brain “act young” again. In the alpha state fears, habits, and phobias begin to melt away. Alpha brainwaves bring an effortless sense of comfort, peace, and harmony. The alpha state is the first layer of our subconscious mind. A gateway to deeper states of awareness. Theta brainwaves become prominent when we go deeper into meditation and relaxation – almost trance-like. Here, brain activity decelerates to the threshold of the sleep stage. One of the more indescribable and wonderful realms we can explore. The theta state produces flashes of creative visualization through vivid imagery. In this state we feel much more open and connected to other people. People often report a feeling of floating while producing theta brainwaves. Theta brainwaves are thought to bring out a person’s dormant extrasensory perception (ESP) skills. The theta state heightens problem-solving skills. Having dominant theta brainwaves are correlated with insight and intuition. Theta brainwaves bring inspired thought and increased motivation. Sometimes long-forgotten memories come to the surface. Children have strong theta brainwaves, which helps to explain their superior ability to learn. Theta is briefly experienced as we climb out of the depths of delta upon waking, or when falling asleep. The theta state is the deeper sub-conscious to super- conscious part of the mind. The deepest level of meditation. The delta state is associated with “no thinking” during deep, dreamless sleep. Delta brainwaves are very rewarding. Delta is said to be the entrance to non-physical states of reality. A crucial state for renewal, healing, and rejuvenation. The immune system strengthens in the delta state. The delta state is the unconscious/super-conscious part of our mind. Many scientists believe this state to be the most beneficial.